The New York Beta Chapter of the Phi Delta Theta Fraternity was established on December 3, 1883 at Union College in Schenectady, New York. Since that time, the over 1000 men who have been Phi's have lived up to their promise of friendship, sound learning, and moral rectitude. They have continually shown leadership qualities as well as strong moral character. Beginning in the early 1880's, the Phi Delta Theta Fraternity desired to establish itself in the East. 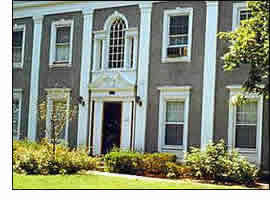 Since the fall of the New York Alpha Chapter at Cornell in 1876, the only Phi Delta Theta chapter east of Pennsylvania was Vermont Alpha, established in 1879 at the University of Vermont. Therefore, the idea of having a Phi Delta Theta chapter at Union College was "promptly embraced." "In the fall of 1883, rumors of new fraternities were prevalent in the institution [Union] It was reported that applications for charters had been made to Zeta Psi and Chi Psi. One day in early November, Dwight L. Parsons and William H. Vaughn were talking in the bell room of the North College colonnade about these rumors ... and when they separated they had decided to see what could be done in the way of forming a new chapter." "After careful studying 'American College Fraternities,' they resolved to apply to Delta Kappa Epsilon or Phi Delta Theta. Vaughn and Parsons corresponded with acquaintances at other institutions. Vaughn received a letter from J. W. Perkinpine, of the Dickerson [PA] chapter, whom he had known intimately, and who highly recommended Phi Delta Theta, and gave full directions about applying for a charter." THE HISTORY OF PHI DELTA THETA, ANNALS, 1882-1884, pp.453-4. The next important moment in the New York Beta history is the building of the chapter house. 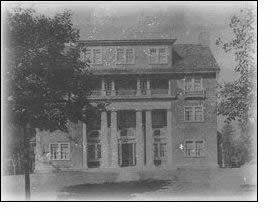 The October 22, 1914 copy of the Concordiemsis reads, "It is expected that Junior Week will see two more fraternity houses open to festivities on the campus ... The Phi Delta Theta house is rapidly nearing completion, and is to be ready for occupancy by November 1. The exterior effect is stucco, while the interior is to be finished in chestnut. it is to accommodate twenty persons and has the suite system of bedrooms. with the billiard room on the top floor. The rooms on the ground floor are separated by movable partitions, so that it may be opened into one large room. The cost is $17,000. the Delta Phi house is to be ready for occupancy by the first of February." "Fire Sweeps Phi Delta Theta"
"Damage Estimated at $40,000 in Early Morning Fire"
These were the main captions which caught the reader's eye in the Friday, December 31, 1948 edition of the Concordiensis. According to a February 25, 1948 caption, "Schenectady firemen used over 100,000 gallons of water during the two hours of early morning fire fighting in near-zero weather while attempting to quell the flames that swept Phi Delta Theta's fraternity house. The blaze caused approximately $40,000 of damage to the building ... [the fire] brought out 11 pieces of fire fighting equipment early Monday morning, December 27 . No occupants were in the house because of Christmas recess. Cause of the double alarm fire was undetermined but unofficial fire department comment mentioned the oil burner and defective wiring which insurance inspectors found. the building was insured for $50,000." The damage from the fire was rectified within the next few years, in which the Board of Directors for the Alumni Club assured the active brothers that they would soon be able to live in their own house. The house was reconstructed with the original plans in mind. Remains of the original structure can be seen today, not only in pictures or sketches, but also in certain parts of the chapter house itself.